The question could be avoided no longer. The Burrito Selection Committee had exhausted discussions on the historical importance of Phoenix. We’d dug in deep to find a great burrito in El Paso, the only Texas city with a real burrito presence. We’d found representation for the obscure Mexican hamburger in Colorado and the beautiful green chilies of New Mexico. But what should we do with the burrito-selling establishment with the most online love in the West — KoMex, an Asian-fusion joint off the Las Vegas strip that none of us had heard of? Vegas is a significant point on the culinary career trajectory of any restaurateur these days; committee member and renowned chef David Chang spends a lot of time there, and yet he didn’t know the restaurant. Before FiveThirtyEight, Nate Silver was a semiprofessional gambler and burrito blogger, and yet it wasn’t on his radar. Could this be a culinary case of what happens in Vegas stays in Vegas? It was up to us to figure it out. The six members of the BSC had gathered in a conference room at Chelsea Piers in New York City to perform the herculean task of determining the best 64 burritos in the country. The plan was for me to then go out on the open road to each of the restaurants to eat and determine America’s best burrito. My colleagues were Chang, food critic Bill Addison, academic Jeffrey Pilcher and the foremost expert on Mexican-American fast food, Gustavo Arellano. And of course Silver, El Padrino of the Burrito Bracket. It was time to vote on the West, a region vast and varied. For our purposes it includes the western half of the United States, excluding California and splitting Texas and Oklahoma in two at the 97°24’ West longitude. 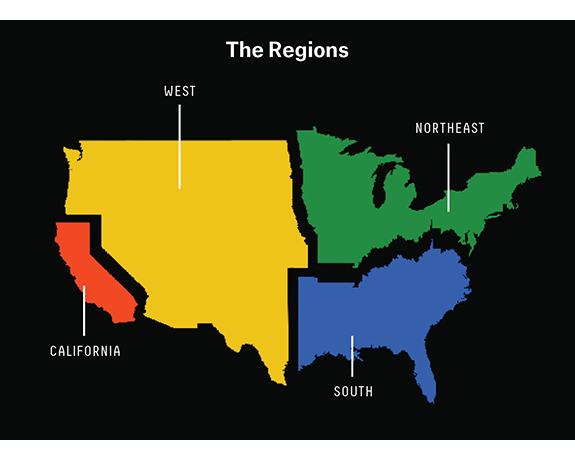 At first glance at the data, the West seems on par with the Northeast for quality of burritos, with those two regions hovering far below California and far above the South. The West and Northeast have a roughly equal number of burrito-selling establishments and similar Value Over Replacement Burrito1 scores. But with geographical and culinary ties to the border of Mexico, the width of which no other region can claim, the West offers serious competition. While it doesn’t have much of a history with burritos (we’ll get to that later), the region is flush with all the flavors necessary for greatness, at least in the Southwestern parts of the United States, and pulls in potentially delicious options from surprising places. Food historian Jeffrey Pilcher represents the Burrito Selection Committee in the West; he was tasked with wading through the region’s 15,212 burrito-selling establishments.2 He then matched the data up against recommendations from a network of food historians and his own personal knowledge. In writing his book “Planet Taco: A Global History of Mexican Food,” Pilcher traveled throughout the world eating Mexican food (in the name of social science, he insists). The man loves food, and is a friend of the burrito. 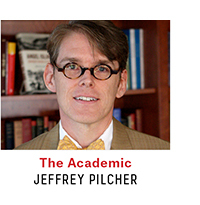 Pilcher exudes academic — he’s careful when he speaks, and a conversation about burritos becomes a conversation about national identity politics as often as where one can find the best carne adovada. When we gathered for the BSC, he was in Pollenzo, Italy, teaching a course at the University of Gastronomic Sciences, which meant he had to participate in the grueling eight-hour voting session via Skype. In much of the Southwest, burritos have a bad reputation for not being “authentic” Mexican food. Pilcher thinks these definitions of authenticity are too narrow; border culture is a regional culture, every bit as authentic as those to its north and south. It’s true that Mexican-American food is not the same as Mexican food, but burritos are not bastardized foods, they are Mexican foods adapted to their context. The flour tortilla is more portable and holds up longer than a corn tortilla. It can also be made much bigger than a corn tortilla, and as any American knows, bigger is better when it comes to food in the United States. All were confident that Arizona, Colorado and New Mexico would make a strong showing. Beyond that, the committee had few preconceived notions of where I’d end up eating. Faced with nearly 16,000 choices scattered across the plains, mountains, deserts and islands of the West, who would make the cut? 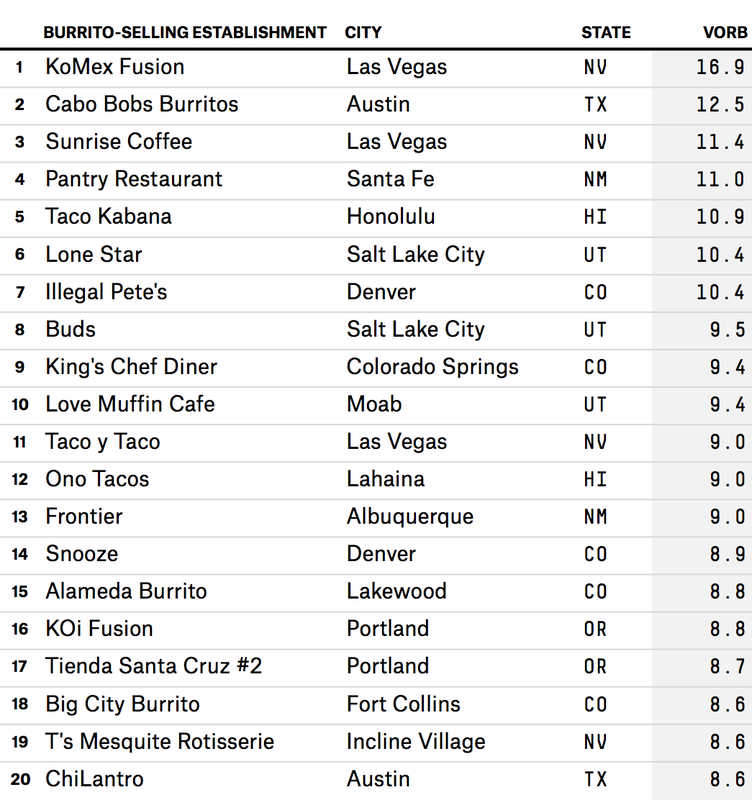 As predicted, the first round of voting produced top seeds in the four cities with the most burrito heritage: Albuquerque, Phoenix, El Paso and Denver. El Paso is the one part of Texas that experts agree has a history of burritos. Pilcher said he wouldn’t be able to forgive himself if Phoenix didn’t host a top seed. Albuquerque? Well, they love burritos so much the city just had its own NCAA-style burrito bracket, and it was intense competition. Denver’s love affair with burritos in recent decades is responsible for delivering the bundled delights to the far corners of the United States. So, who are these top seeds? Frontier in Albuquerque is across the street from the University of New Mexico and open seven days a week until late, making it a college town favorite. Pilcher swears by its carne adovada burritos, and with little discussion it slipped into the No. 1 seed in the West, with five out of six BSC members voting for it in the first round. Carolina’s Mexican Food doesn’t rank high on Yelp, but its ability to serve up a moist red machaca burrito wrapped in a house-made flour tortilla won it the requisite seat for Phoenix. Just across the border from Juarez, one of the few cities in Mexico with a burrito tradition, the boldly named Delicious Mexican Eatery in El Paso took the No. 3 spot. Now for Denver. Maybe it’s the mountain air, but the Mile High City is surprisingly flush with good burrito options. It spawned Chipotle, bringing the Mission-style burrito to the masses, though Denver-style burritos are smaller (and “smothered” in chili sauce). Illegal Pete’s topped the list of several contenders, earning the No. 4 seed in the West. We also wanted to represent the spectrum of lesser-known burrito styles available in the West. The Mexican Hamburger is truth in advertising, a hamburger patty rolled up in a tortilla and smothered in chili. Luckily for the Burrito Bracket, BSC member Gustavo Arellano once blind taste-tested a variety of the Mexican hamburgers on offer in Denver (the only place in the world they are available as far as we know), and determined that The Original Chubby’s served the best. Hawaii — yes, the FiveThirtyEight burrito correspondent is going to cover Hawaii — presented two surprisingly delicious-sounding options: Taco Kabana in Honolulu and Kono’s on the North Shore of Oahu. While Taco Kabana made higher marks on Yelp, the BSC couldn’t resist the allure of a Pacific-fusion burrito stuffed with a kalua pig. Kono’s was voted in early, and this correspondent had no complaints. Although meat is a common denominator of the burrito bracket, a few plant-based burritos offered promise. Joel’s in Sandpoint, Idaho, serves dozens of vegetarian options, including a tofu fajita burrito that gets a lot of love from Yelp reviewers, several whom claim to be from San Francisco. Pepe Delgado’s in Norman, Oklahoma, has an item on its menu called “The Thing,” a vegetarian burrito loco with potato and avocado that seems to be a godsend in Oklahoma’s burrito-barren landscape. Returning to the Yelp data, we voted a few high-ranking favorites into the West’s unseeded 12. Among them: Cabo Bob’s in Austin and The Pantry, a Santa Fe classic. We felt we had to include the Pacific Northwest (even though one Seattle reviewer described a torta as “a Mexican Bahn-mi,” revealing how little the area knows about Mexican food), and Rancho Bravo in Seattle seemed to have the most potential. Tucson’s St. Mary’s Mexican Food made it in on tortilla reputation alone. Its enormous flour disks are made by hand, no machines involved. The owners hail from the northern Mexican state of Sonora, the burrito’s most likely birthplace. Duran’s Central Pharmacy in Albuquerque is a combination restaurant-pharmacy (restaumacy?) where everything is made in house. Both got unanimous support from the BSC after a rousing speech from Arellano. At last, it was time to deal with Vegas. It wasn’t until the fourth and final round of voting that KoMex Fusion, the Las Vegas eatery with a surprising debut at No. 1 in the West and No. 2 in the nation by VORB, finally made it into the bracket. Despite the BSC’s incredulousness, it fell in the realm of “too high a VORB to ignore.” In the entire country, only the famed El Farolito in San Francisco’s Mission District did better. Time will tell whether data mining Yelp will strike burrito gold in the great American West. Value Over Replacement Burrito accounts for quality and quantity of Yelp reviews, while adjusting for location. More on that in the Burrito Bracket manifesto. Taken from our Yelp data set.